We sadly lost one of our orphaned rhinos, Muddy, on the 6th July 2016. He started having trouble with his breathing around the beginning of July, following a bout of diarrhea a few days earlier. Dr Rogers attended to Muddy daily, providing him with the best and latest medical treatment (this did not come cheap, but when working with such endangered species, no expense is spared)​. Dr Rogers has been our vet for the past 21 years and has 30 years’ experience in the capture and treatment/ translocation of at least 2000 rhinos. During this time, Muddy had three keepers who took turns looking after him around the clock, in his meticulously maintained and heated quarters. Taking Muddy’s tender age into consideration, when he started breathing heavily we suspected the most likely cause to be pneumonia. Upon Dr Rogers’ inspection it was clear that Muddy had fluid in his lungs. As Muddy was found stuck in mud in the wild, there is a possibility that he didn’t have colostrum (the first milk full of antibodies which transfers a passive immunity to a calf to build resistance against infection, including pneumonia in this case). When his situation wouldn’t improve, his medication was adjusted accordingly but nothing seemed to help. Following Muddy’s passing, Dr Rogers insisted on a post-mortem in order to learn from this tragic loss. The results were unexpected, as it emerged that Muddy’s heart sac was filled with blood. This meant his heart could contract but not relax, causing a buildup of blood in all the organs, including the lungs, resulting in lung oedema. A tear in the right atrium, one of the four heart chambers, was the reason for ​this accumulation. The cause of his death was ruled as heart failure, which could have been neither anticipated nor prevented, and was actually unrelated to his illness. 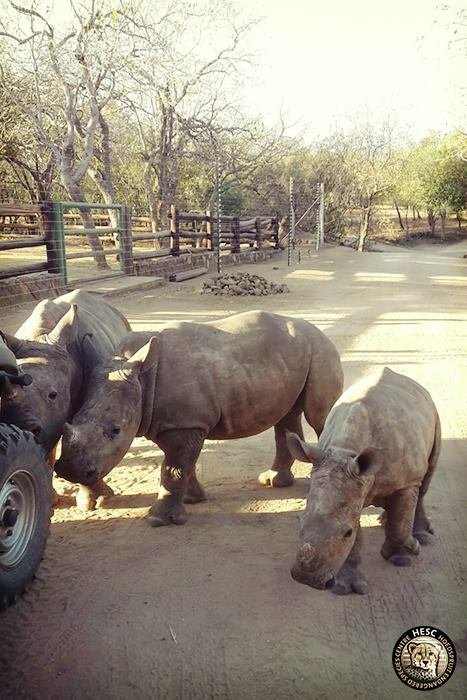 Muddy shared a boma and spent his time with three other orphans – Olivia, Khulula and Nhlanhla, also known as ‘Baby N’. Nhlanhla was Muddy’s closest companion, and the sudden void left by his absence had a marked impact on the young rhino in the days following his death. Nhlanhla would walk around on his own, clearly looking for his friend. When he, Olivia and Khulula took their daily walk, he would wander off on his own before suddenly realising that his partner was missing. Thankfully after about two days, he started to adjust to the absence. 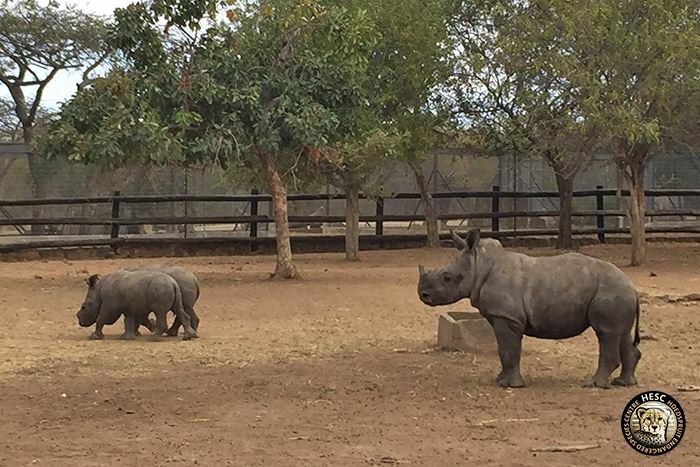 He’s now formed a stronger bond with Olivia and Khulula, and the three rhinos have become an inseparable unit. It’s heartwarming to witness how compassionate and comforting these incredible animals are to each other, and how quickly they bounce back after a tragic life experience. Even though his life was short, Muddy touched many hearts and we will always be grateful to have played such a crucial role for the time he was with us. It was our privilege to have been able to take care of him. Thank you for all you did for beautiful baby Muddy. His life was heartbreakingly far too short, but fortunately he was tremendously loved by his human, rhino, and sheep family at HESC, and by those of us watching from afar. Muddy is forever missed and forever fondly remembered. So sad…maybe he fought to hard to free himself from the mud and tore his tender, young heart muscle. RIP, beauty!